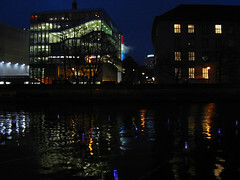 Floating Islands is a mechanical floating orchestra which was commissioned for the opening of the Royal Netherlands Embassy in Berlin. 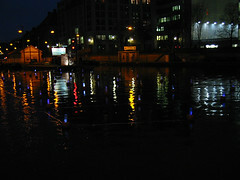 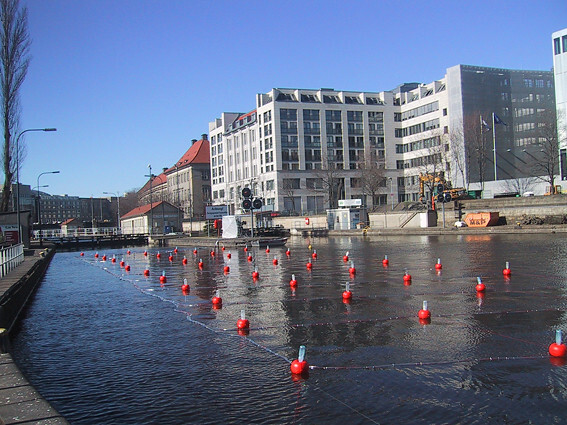 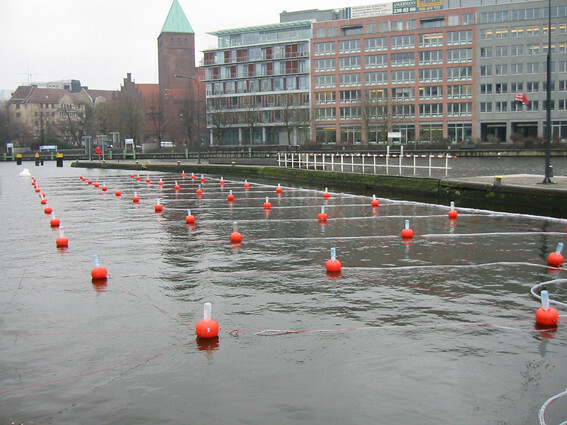 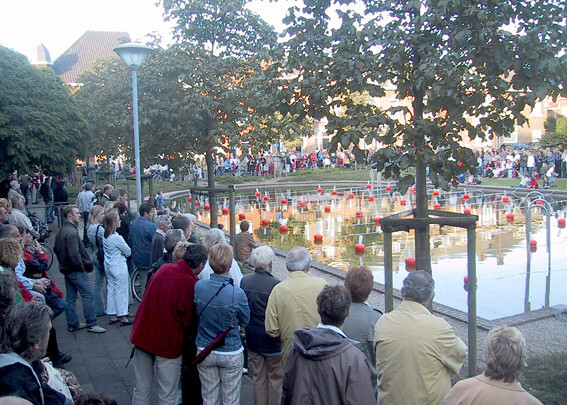 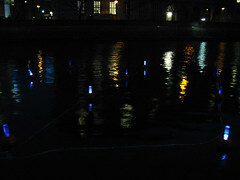 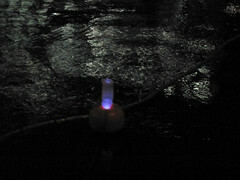 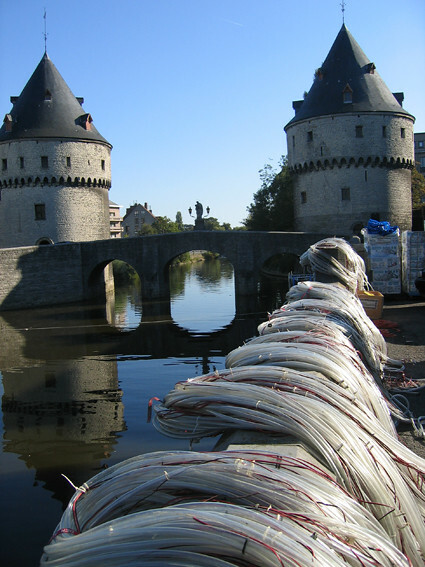 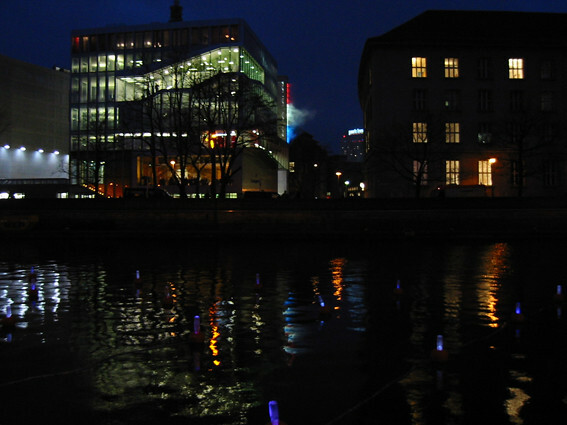 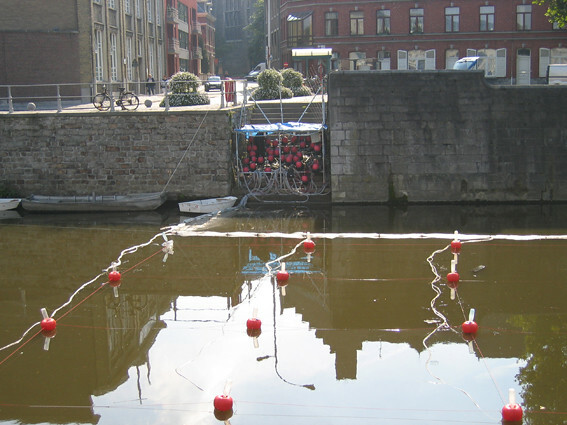 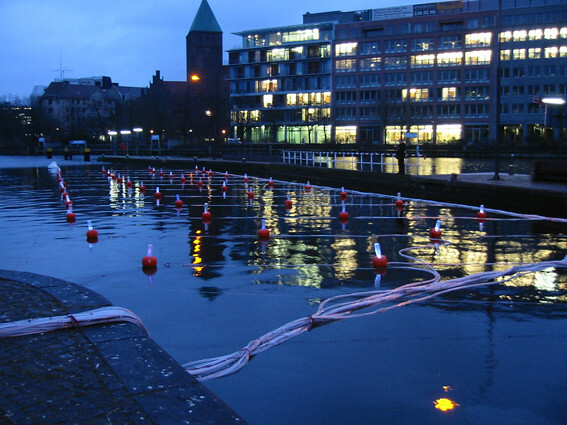 This sound and light piece was installed in the River Spree, facing the Embassy building. 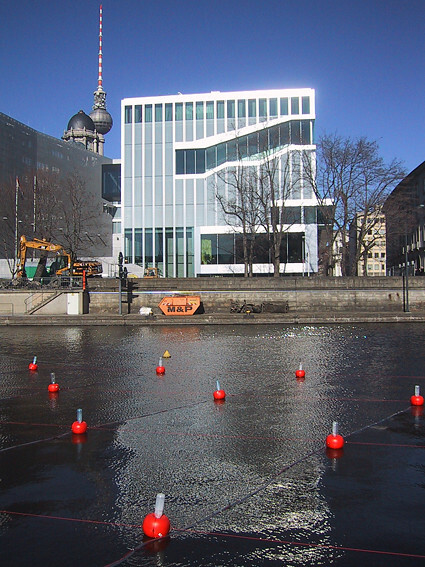 The project was presented by sound art space Singuhr – Hörgalerie in Parochial – Berlin. 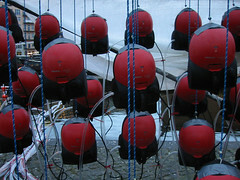 The orchestra consists of fifty small floating “sound islands” made up of fifty vacuum cleaners, plastic bottles and illuminants. 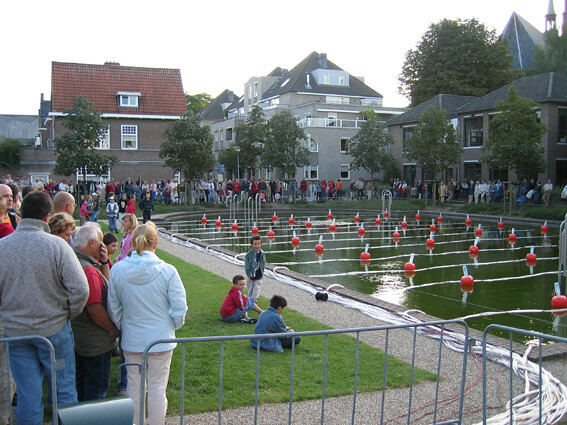 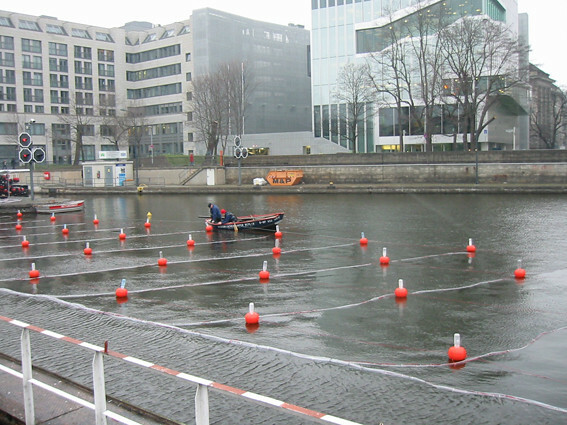 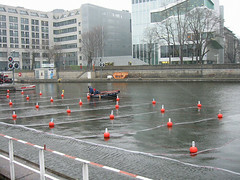 A 60 by 15 meter formation fixed in a free water space. 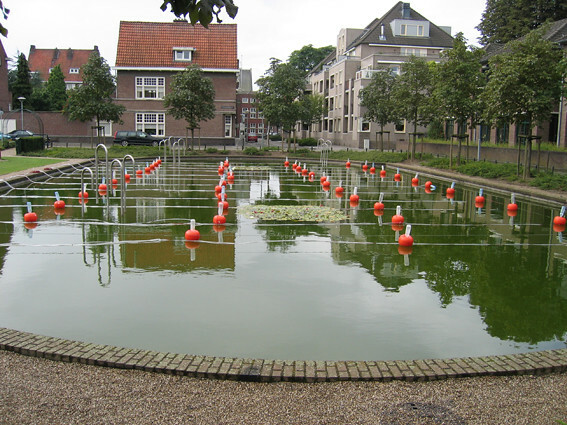 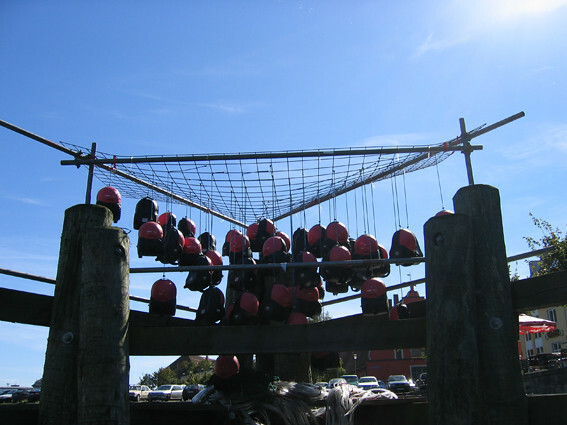 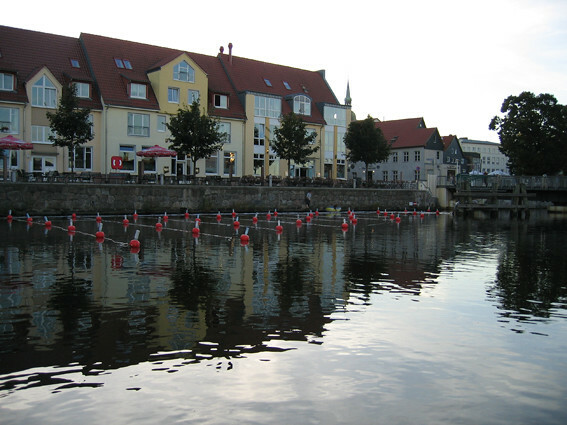 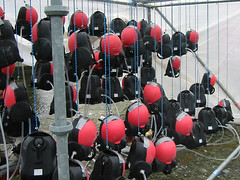 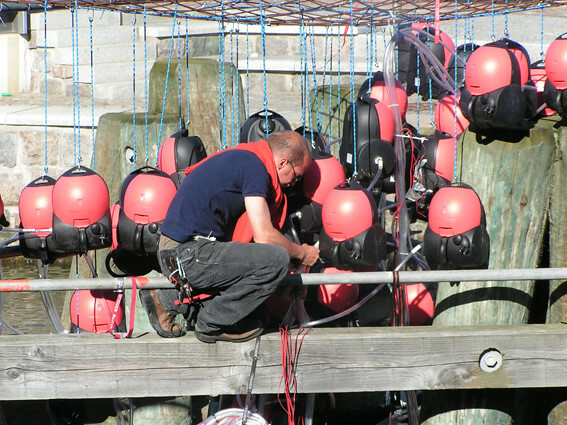 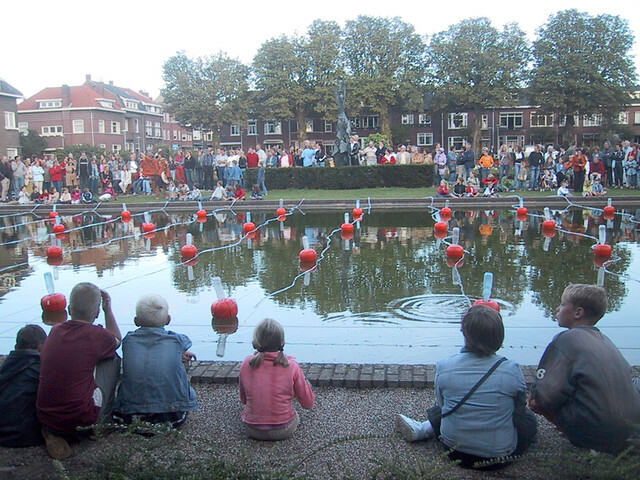 The base bodies of the ‘islands’ are constructed from floating red hard plastic buoys. 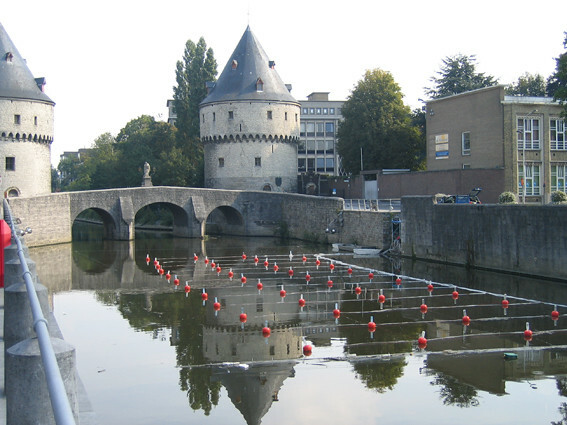 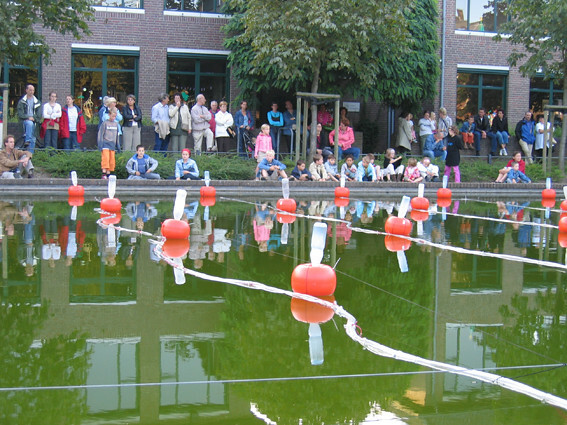 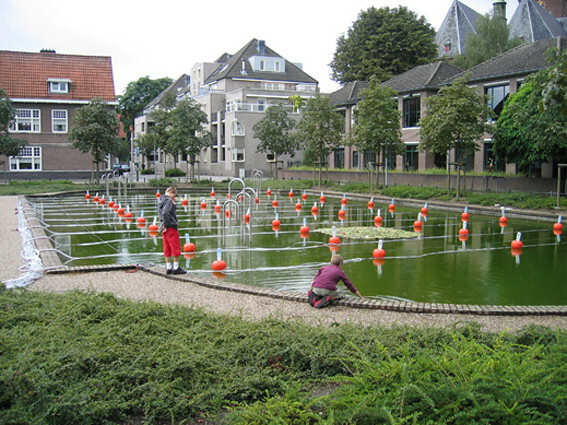 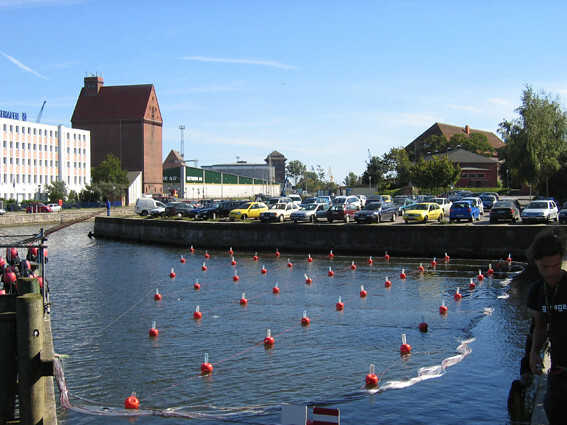 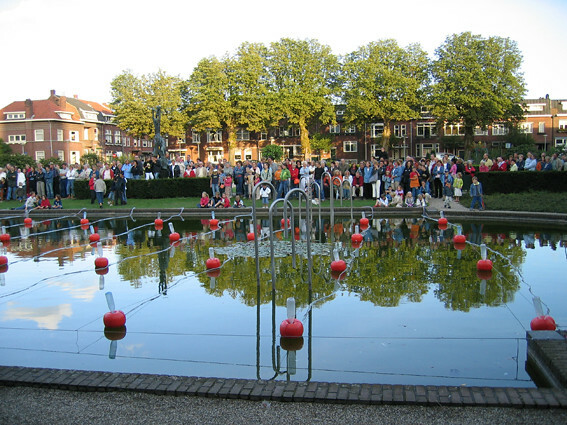 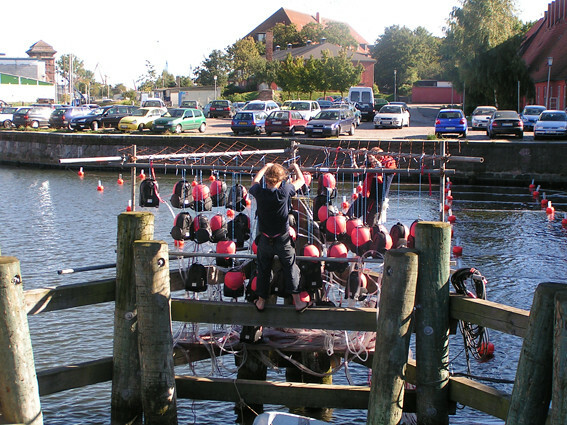 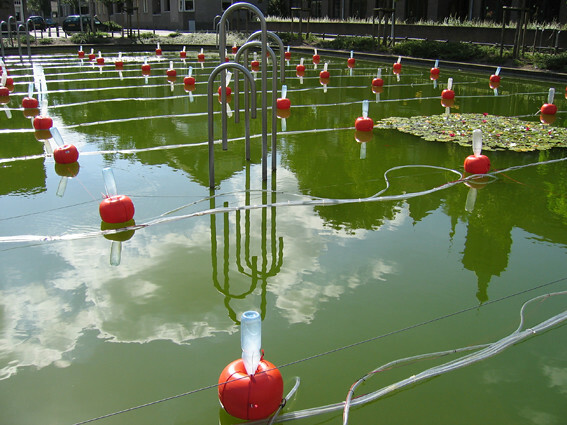 Self-built flutes made from transparent plastic bottles are fixed on top of the buoys, a battery of 50 vacuum cleaners is connected with the ‘floating islands’ via a hose system. 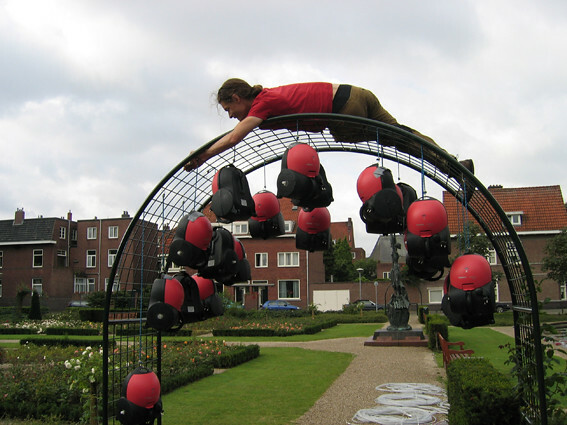 Hanging in a big framework on a swimming plattform or on land the battery of vacuum cleaners breathes life into the flutes like a huge lung. 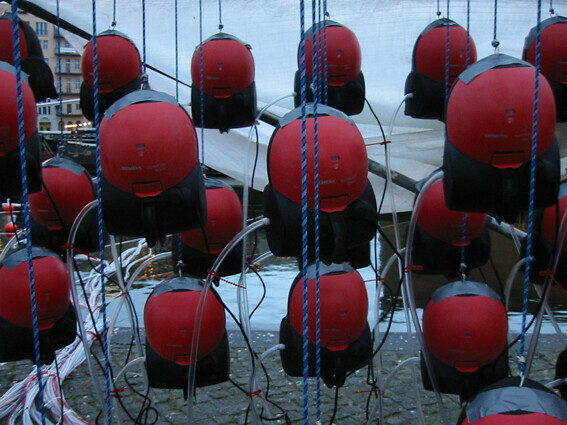 The steering unit consists of a controller running a composition and a midi-to-volt-translator triggering a solid-state relays system switching the vacuum cleaners. 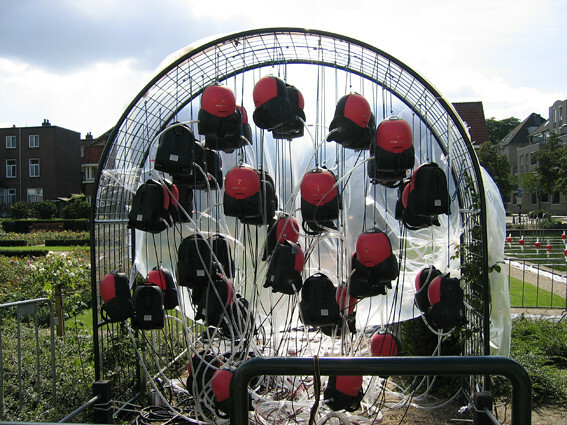 Since the vacuum cleaners hang in the framework they swing when triggered, thus making the installation more transparent and pulsating. Each island has an additional light element built into the bottles that will, at night, instead of playing the flute only visually interpret the composition. 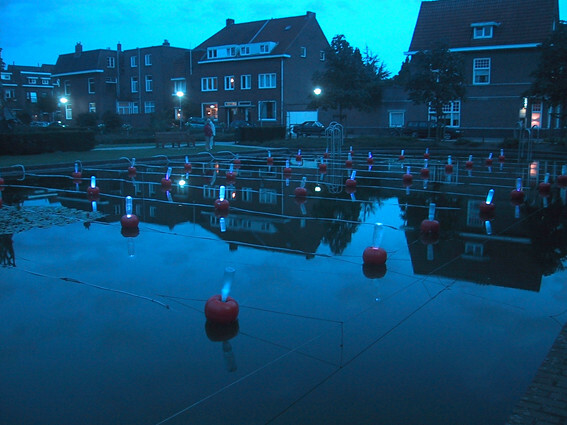 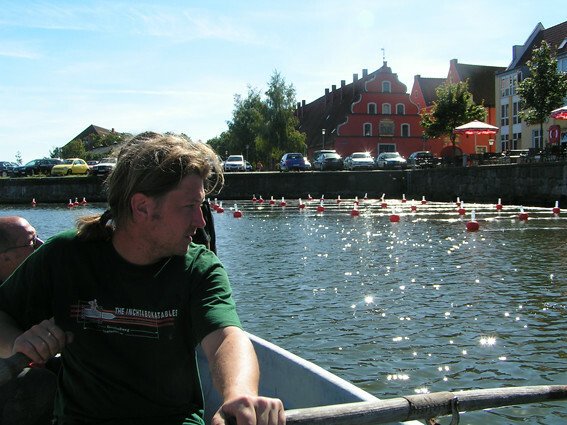 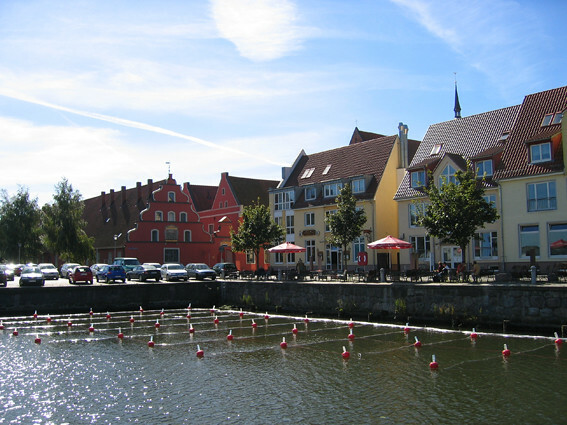 The compositions are created for a permanent altering and moving sound programme on this floating soundfield. 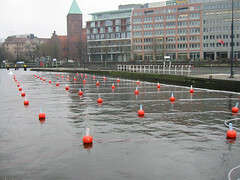 with friendly support by : botschaft des königreichs der Niederlande (George Lawson), mondriaan stichting amsterdam, siemens electrogeräte gmbh, stichting intro maastricht, ev. kirchengemeinde marien, wasser- und schifffahrtsamt berlin, pfefferberg entwicklungs u. verwaltungs gmbh, grafisches büro cyan.